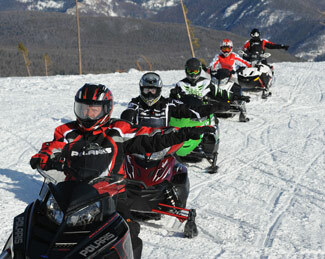 Most provinces and states offer snowmobile operator safety-training programs. Many state and provinces have mandatory training courses for youths and under-age drivers. Programs throughout North America can be obtained by contacting your state or province organization. Through these programs, millions of individuals have received formal safety training. 22-minute safety video titled Safe Riders, You Make Snowmobiling SafeThis video features key safety issues and areas of rider responsibility explained and presented in an easy-to-understand fashion. Safe Riders! 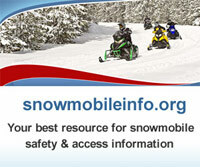 Safety BrochuresDiscusses key areas of snowmobiling safety. Safe Riders! PostersThese include a variety of posters such as a logo poster and position posters discussing key issues of the safety campaign (i.e. : alcohol and riding don't mix, always check local ice conditions). Video Public Service AnnouncementsFour, TV production quality, public service announcement videos covering key safety issues within the snowmobile community. Radio Public Service Announcementsare broadcast ready. Additional information is available through the ISMA website at www.snowmobile.org. The snowmobile community, led by the snowmobile administrators and state and provincial associations sponsor the International Snowmobile Safety Week. Working in partnership with the manufacturers, the organizations publish a safety week manual that is used to assist clubs and other organizations sponsor safety-related activities, classes and awareness weeks. 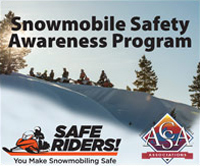 Most states and provinces have safety week recognized by their chief public policy leaders and proclamations recognizing the importance of snowmobiling and snowmobile safety done annually in conjunction with International Snowmobile Safety Week. Safety week is historically held the third week in January and manuals are available from the ISMA office free of charge. Provincial and state safety education programs include classroom instruction and sometimes field instruction. Snowmobile instruction courses are taught by specially trained volunteer teachers. The courses cover maintenance and machine operation, proper riding positions, proper clothing, terrain, weather and wind conditions, environmental awareness, skill, courtesy, judgment and common sense. Provincial and state operator training programs are often funded with snowmobile registration fees or user fees. Clubs and school systems are also engaged in safety education campaigns. More than one million copies of the Snowmobiler's Safety Handbook, published by the SSCC, have been distributed to snowmobile enthusiasts throughout North America. Snowmobileinfo.org provides an online calendar to locate training, workshops and events nationwide or near you related to snowmobile safety and access topics. The calendar provides state, location, dates, topics and registration information.